Comets are said to be composed of “dusty ices.” Why have crystalline structures that require high temperatures been found in them? On February 7, 1999 NASA launched the Stardust spacecraft on a mission to collect dust particles from the coma of comet Wild 2 and then return to Earth. Fuel savings meant that the capsule required a gravity boost, so it returned to Earth orbit from deep space after almost two years of travel time. As it flew by the home planet, it was accelerated back out to its aphelion, 400 million kilometers from the Sun, reaching a distance greater than any other solar-powered spacecraft. After a five year journey, Stardust finally intersected Wild 2’s orbit on January 2, 2004, passing through its coma at the metaphorical hair’s breadth distance of 240 kilometers. The aerogel dust-capture system worked perfectly, scooping up fine bits of rock and trapping them inside for their return journey to Earth on January 15, 2006. Although the spacecraft traveled more than a billion kilometers over a 7 year time span, the mothership successfully released its payload and the parachutes deployed, cushioning the precious cargo for a soft landing in the Utah desert. The aerogel was delivered to a thrilled team of researchers for analysis. That’s when the surprise and shock began. Minerals such as anorthite and forsterite were found embedded in the aerogel—compounds that form only at extremely high temperatures—along with olivine. Perplexed scientists wondered how an object that was supposed to be a remnant from the early nebular cloud out of which the Solar System condensed, and that should have been kept in frozen hibernation in a theoretical “Oort cloud” billions of kilometers from the Sun, could exhibit crystalline structures that would require a blast furnace to create. Now, according to a paper in the science journal Nature, a mechanism by which such high temperature crystals might form has been announced. A team from the Max Planck Institute for Astronomy examined the light emitted by EX Lupi, thought to be a young star in the constellation Lupus. EX Lupi is a variable star, meaning it periodically brightens over a several month period. 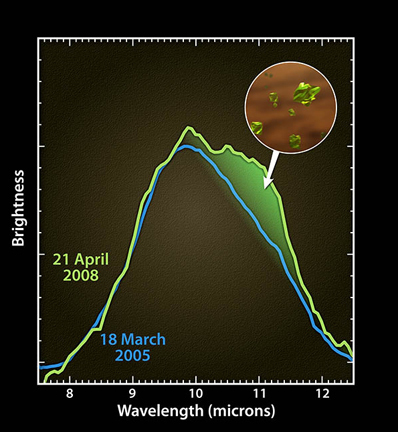 After one energetic pulse in 2008, the infrared spectral signature of the star seemed to indicate that some of the orbiting dust had been changed from a glasslike substance to one that is similar to what was seen in the spectrum of comet Wild 2: high temperature crystals. Among astrophysicists, the consensus opinion is that stars like EX Lupi undergo energetic eruptions because they gravitationally drag material from their surroundings and accumulate it on their surfaces. The added mass compresses to the point where it explodes in a thermonuclear reaction and the stars “go nova.” Note that this is quite different from a supernova explosion where a star casts off its outer layers due to a disruption in its hypothetical core fusion reactions. The supposed nova on EX Lupi is said to have heated the glasslike matter around the star until it became “thermally annealed” and changed its physical structure into harder crystals like the forsterite discovered in the coma of Wild 2. In other words, it is the old standby of gravity, heat, and shock waves that are responsible for what is observed. Comets, specifically, have nothing to do with an ancient nebular cloud of cold gas and dust that became gravitationally unstable and collapsed into the Solar System of today. Comets and their asteroid sisters are relative newcomers to the solar family and might have been blasted out of larger bodies by tremendously powerful electric discharges in the recent past. They are not “snowballs” or blobs of muddy slush, they are solid, rocky, cratered, electrically charged objects. Whatever water or hydroxyl compounds that can be found in cometary comas is created there because ionized oxygen from the comet reacts with hydrogen ions streaming out from the Sun. No “jets” of water vapor spew from comets, and no icy plains have ever been observed. It is electric effects that are seen—discharges and arcs form the comet phenomena. Similarly, stars do not oscillate in brightness or energy output because they are accumulating excess mass. They do so because they are experiencing an increased electrical input from the galaxy. The electric current flowing into the star causes it to change its discharge behavior. It might go from a stable and (what is for it) “normal” glow mode to a more intense arc mode state. The greater current flow might cause z-pinch regions around the star where its plasma could then be reformed into different chemical compounds. It is more likely that processes involving plasma are responsible for the changes in stellar spectrograms. The Sun and comets are part of one electrically active circuit that is occupied by many different regions of charge distribution. The Sun receives its power from the protean electric generator we call the Milky Way. Accordingly, planets and other bodies exist within a flow of charged particles constantly streaming from the Sun. As any first year electrical engineering student knows, a stream of charged particles is an electric current.